How to activate and overcome all NPC's quests in Bloodborne! In Bloodborne universe hides many small worlds made by the stories of the secondary characters of the game. It will be very difficult to figure out how to help these people because the game does not provide any kind of help or explanation about them. The below information is taken during our Bloodborne gameplay. If anyone has more information on submission, can write them in the COMMENTS and we will update the guide as soon as possible. WHERE TO FIND HER: After opening the gate on the left side of the lantern Yharnam Central (if you do not know how to open it you look at the BOSS GUIDE TO PLACE section of CHIERICO BELVA) back in the area with the dog in the cage and go over the small bridge to enter a building with a large window that emits a red light. Go down the stairs and take out the enemy. Continue to the next area and go down into the canal with water. Keep walking to the right until you reach a wooden footbridge. If you look just below you, you'll notice a corpse with an object surrounded by creeping enemy apparently dead. DON’T go down but climb the long ladder that is there on the right side of the walkway. Once at the top, cross the small bridge to the left to find in a large area with a Brutus. The Brutus will not notice you until you attack him or ascend the ladder to the right. At the top you will find yourself behind a gate that you already know and facing the square with a fountain near the Brutus who beats the big door. Before opening the gate, speak from the left window with the Baby barricade at home. The small will tell you that his parents are out for the hunt and have never returned. Will inform you that his mother has a PIN RED while his father is a hunter and sometimes loss her mind. Precisely for this reason, will give you a CHIME with which to return the right to dear daddy. The most observant will have already realized that the father of the girl is none other than FATHER GASCOIGNE, one of the boss / prey game. The Carillon will in fact be a very useful tool to eliminate him. DELIVER THE PIN: In this way the child will thank you in the house, closing prey to tears. A1-The child will not talk for a long time. 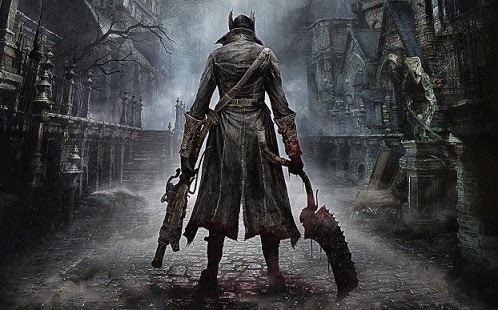 Until they find a PIG in SEWER of YHARNAM CENTRAL, delete it to find that the little girl is dead in the street resulting in the RED BOW FOR THE MESSENGERS. B-SAY THAT HE FOUND NONE: This way you can keep the brooch and continue the mission of Little girl going to cross with another quest which we discuss below. By doing so, you can also equip and use the brooch. Your character in the smash finding a gem of Blood powerful enough with which to make an upgrade of your weapons. B1-If you have already spoken with the deformed creature in red entrance of CHAPEL OEDON, come back and talk to the little girl to send it in the chapel that is a SAFE SHELTER. B2-Unfortunately, the girl died on the street and you will get, always from Pig cited above in A1, the RED BOW FOR THE MESSENGERS. In both cases, go back to the window of the girl after beating Boss / Preda ROM SPIDER obtuse. If you speak with the window will answer the older sister of the child who will ask, in fact, to find his sister. Show her RED BOW FOR THE MESSENGERS and stay waiting out the window to hear the dialogue. Return to the DREAM HUNTER and returned by the woman. Go down the stairs next to the window and you will find the BOW WHITE FOR THE MESSENGERS. OPTIONAL: If you talked to Iosefka from the door of the clinic, the point at which you start the game, you can choose to send the child also to CLINIC, generating a kind of option C in phase 2 choice of view just above. In this case the child will disappear without leaving anything and will not appear even the Pig in the sewers. This way you terminate prematurely the quest. Same thing if you will not talk to her ever again after finding the PIN RED. Arrived at a certain point in the game the child will disappear without a trace. WHERE TO FIND IT: Probably Gilbert will be the first NPC with whom you speak. Just turned the lantern Yharnam Central, you can talk to him through the window to the right of the gate on the left. Will provide information on where to go and how to continue. We will provide more information on where to go and some PHIAL to continue. It will give you a weapon, the FLAMETHROWER, firearm very effective with enemies who fear the fire element, in fact. Spray a jet of continuous fire short-range missiles and consumes Mercury depending on the time of use. Very useful against wolves that you will find in Old Yharnam THE BEAST OF BLOOD THIRSTY. Return to Gilbert after the change of the LUNA to find that now the man has become a beast that wanders near the lantern. Take him out to get the RUNE CLAW. LOCATION: From the Chapel Of Oedon, just slightly behind the lantern area, to the right, you will see a repugnant be dressed in red. Talk to him to start the next mission. OPTIONAL: Once you start the mission, you can kill the creature from his corpse and get the RUNE OF OEDON that will allow you to increase the maximum number of bullets of Mercury that you can take with you. Remember that you can tie the Runa to a weapon only in the advanced stages of the game. If left in the little life to be deformed, will provide information on the survivors that you will bring to the Chapel and new GESTURES for every survivor who will bring. OLD surly - You will find it in YHARNAM CENTRAL, near the stairs that go down into the sewers where there is a large glass red. There are also many dogs in the cages. To talk to her you should speak to the window on the left just before descending the stairs to the sewers. The woman at the beginning will not listen but eliminated the dogs in the area will ask you a safe place to go. Tell him to go to the CHAPEL OEDON (Please note that the option will not be available if you do not first talking to your GUARDIAN OF THE CHAPEL mentioned just above). Head back to the Chapel to find the woman sitting to the left of the open space located just ahead of the Lantern, for the moment will not give you anything, just a shower of insults. OPTIONAL: If you hit the woman will find that he can not die but will become even more hostile towards you, it is not clear what is involved in this change in the future. INFO: I'm in doubt I whipped to blood!